Always looking for new ways to use up lean mince products, this week I thought it was time to combine that with some of my favourite Vietnamese Cuisine. The result is a lovely zingy fresh salad that is packet with gorgeous Asian flavours. 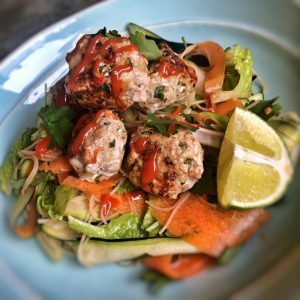 This dish makes a lovely lighter evening meal (which I’m often looking before to have if I get back from the gym a little late) and would also make a lovely filling lunch. If you would like to make the dish for two, I would advise making all the meatballs and then popping half into a food bag raw and freezing until you need them again. Then just half the salad ingredients. I would make all the dressing though, its 0sp, so you can have as much or as little of it as you like. All all of the ingredients for the meatballs to a big bowl, get your hands in there and give a good mix. Once everything is nicely combines, take a large plate and then roll mixture into 20 walnut sized meatballs. Spray a large frying pan with 1kal, heat to medium and then add the meatballs, cooking for 8-10 minutes until cooked through and nice and golden on the outside (you might need to do this in batches depending on the size of your frying pan. In a smaller bowl, add all of the dressing ingredients, stir until the sweetener dissolves and then adjust to suit your taste (whether it be a little more lime, chilli sauce ect). In another large bowl, add all the salad ingredients expect the rice noodles and half the dressing. Give a good mix. Remove the cooked meatballs from the frying pan and pop on a plate to one side. Then add the other half of the salad dressing to the frying pan, turn up to high and add the rice noodles. Flash fry for 2 minutes until the noodles are cooked through and have absorbed some of the dressing. Pop the noodles in the bowl with the salad and toss everything together and then separate between four bowls. Top each bowl with 5 meatballs, squirt over a little sriracha and enjoy!